Wow. I’m not sure what I expected when I began to read “Days? Or Ages? The Genesis Question,” but it was not such a thoroughly well-written text. Author Jerry Harmon sets up the very controversial topic of how long it took the Earth to be created by building a foundation that anyone (no matter your position on the age of the Earth) can relate to. Harmon accomplishes this by describing a really interesting scenario for how they wrote this book: Harmon and a group of men from his church started a short bible study on creation (they all held traditional views of Creationism). From there, they began to research the various views on creation more and more until it became this book. In his book, Harmon provides everything an effective argument needs: he builds a foundation by providing both a context for the argument in both biblical and historical senses, and a definition of terms. This history is impressive because it manages to show previous interpretations of the Bible held by church leaders that were proven wrong over time. 1. What is the question we need to ask? 2. What are the current views of how long it took the Earth to be created? 3. What does history show? 4. What should we observe about Genesis 1 & 2? One Week, or Longer? 5. Does Scripture say when creation began? 6. From all of this information, what then, can be said? In full self-disclosure, I began reading this book strongly convinced that God created the Earth in six contiguous days; however, now I’m not so sure. 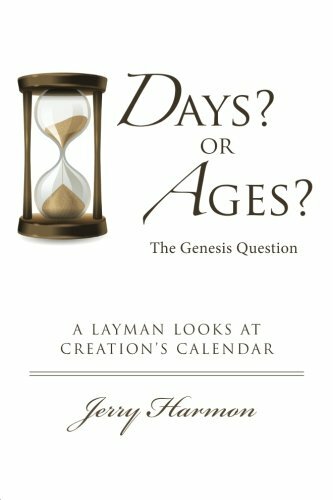 If you have ever wondered about what the Bible says about the age of the Earth, Harmon lays out a pretty convincing argument, systematically dismantling the idea that the Bible teaches that God created the Earth in six contiguous days. Because he builds on the foundation of the Church and Jewish history, his argument seems solid. For example, each current theory of creation is laid out without obvious bias (I appreciated that he took the first four chapters of the book to build to his argument—he did not try to convince the reader before all of the information was presented). His strongest argument deals with the way the ancient Hebrew language has been interpreted through the years. In fact, he spends one whole chapter discussing just how many ways there are to translate Genesis 1:1. What I found most helpful, though, is the sixteen-point summary in the final chapter that helped me to wrap my mind around each specific part of his argument. There is so much more that can be said “Days? Or Ages? The Genesis Question” by Jerry Harmon. If you are interested in understanding what the Bible says about the amount of time it took God to create, I cannot recommend this book highly enough. This is a book that I will continue to study.